What is redirecting the payment? Redirection of payment is a process in which the customers, as well as the clients, are required to adapt themselves to the changes in the payment procedures made by the company. The clients and customers are obligated to adjust themselves according to the changes because if they will not adjust themselves, they will not be able to retrieve the payment. The changes in the payment procedures may be the change in the account or the company may ask its clients to pay money to a different person as before. When the company wants to inform its clients about the changes in the procedures made by it, it is required to write a formal written letter or a notice informing the clients and requesting them for redirection of payments. 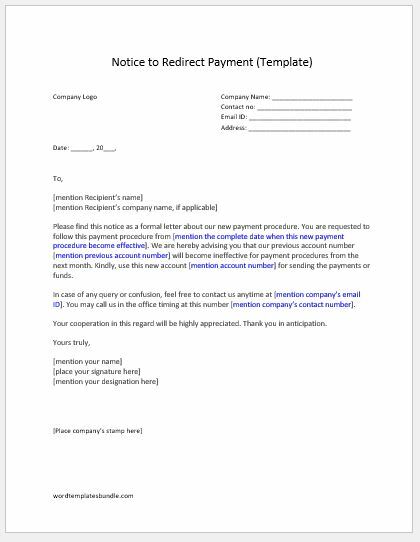 This notice is also used by the company to explain the reasons for redirection of payment. When to send the notice to redirect the payment? There can be many business-related situations when a company has to open a new account for receiving the payments. Sometimes the company also hires a new employee to handle the inflow and outflow of the cash and wants its clients to pay money to that newly hired employee. In these types of situations, it is important for the company to inform its clients by sending them the notice requesting them to redirect their payment so that the payment can be received by the company. Details of the direction of payment such as account number, new Bank name, details of the person to whom the payment should be sent. The date of the redirect notice will be effective and the signature of the notice sender are some important details to be added. Please find this notice as a formal letter about our new payment procedure. You are requested to follow this payment procedure from [mention the complete date when this new payment procedure become effective]. We are hereby advising you that our previous account number [mention previous account number] will become ineffective for payment procedures from the next month. Kindly, use this new account [mention account number] for sending the payments or funds. In case of any query or confusion, feel free to contact us anytime at [mention company’s email ID]. You may call us in the office timing at this number [mention company’s contact number]. Your cooperation in this regard will be highly appreciated. Thank you in anticipation.